Goodreads Summary: Sixteen-year-old Dani is convinced she has nine lives. As a child she twice walked away from situations where she should have died. But Dani’s twin, Jena, isn’t so lucky. She has cancer and might not even be able to keep her one life. Dani’s father is in denial. Her mother is trying to hold it together and prove everything’s normal. And Jena is wasting away. To cope, Dani sets out to rid herself of all her extra lives. Maybe they’ll be released into the universe and someone who wants to live more than she does will get one. Someone like Jena. But just when Dani finds herself at the breaking point, she’s faced with a startling realization. Maybe she doesn’t have nine lives after all. Maybe she really only ever had one. Confession time: I have a soft spot for books with beautiful covers and stories that tug on your heartstrings. Because of that, I was really looking forward to reading All These Lives. Although this book didn't turn out to be exactly what I was expecting, it certainly brought a fresh voice to the YA market as well as a worthwhile story. All These Lives certainly has an interesting premise - could some people really have nine lives or are they just extraordinarily lucky? Dani has walked away from situations that other people wouldn't have, but how far does that grace extend? This book tests that in an interesting way. It has a different view on how cancer affects people. The family struggled to be normal, but instead they were only a hairsbreadth away from dysfunction. Despite that, there were moments where they pulled together and their relationships, especially between Dani and Jena, shone through. Dani was quite a dynamic character; she had a unique, fresh voice that certainly made its impact. I enjoyed her snark and her good-natured teasing of Jack. At the same time, however, she was occasionally difficult and appeared more callous than sympathetic. By the end of the book, however, the depth of her emotion and her love for her sister shone through and gave the book a very powerful ending. However, this book did leave me wanting more. While I appreciated that romance didn't take over the story, it seemed as though the possibility was there but left unexplored for the most part. I also would have loved to have seen more of the relationship between Dani and Jena. The cancer may have been secondary to Dani's personal journey, but she seemed so alone for most of the story. It would have been nice to see her have a better support system. All of that being said, Dani does grow a great deal throughout the course of the story, and her eventual realization was a good one. All These Lives is a moving story about making the most out of life. 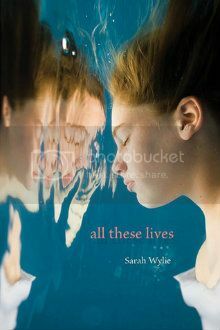 I'll be curious to see what Sarah Wylie writes next! I also have a soft spot for books with beautiful covers and which tug on your heartstrings. I was hoping to see more of how cancer affects the family, so I'm disappointed that the sisters' relationship isn't explored more. This still sounds like a wonderful book though. I received an ARC of this and plan on getting to it soonish. The cover is gorgeous. And I do like a girl with snark.